November 21, 2015, Queens, NY Tonight’s the night. The second most anticipated fight in the sport takes place in the same calendar year. We had Mayweather-Pacquiao, and now we have Cotto-Canelo. The latter promises to be more action-packed than the former. Both of the combatants are ready, at least based upon yesterday’s weigh-in. Cotto weighed in at 153 1/2 lbs. and Canelo came in at 155. PureSportsNY’s Senior Boxing Writer Greg Jacobs feels the fight will be very competitive, but Jacobs asserts, “Canelo is younger, the bigger puncher, and heavier fighter. I don’t see how Cotto keeps him away for 12 rounds.” This is why Canelo is favored by most experts. He has a “sizeable” advantage. Literally. Canaelo figures to enter the ring at least 10 lbs. heavier than Cotto. If Cotto rehydrates to 162, expect Canelo to be significantly larger; he’ll probably come in close to 175. And, Canelo will carry the additional pounds well. Cotto should have the edge early in the fight. It’s not a question if Cotto can solve Canelo. The question is, “Can Canelo solve Cotto?” If it takes Canelo three to four rounds to figure out Cotto, he (Canelo) will probably stop him by the seventh or eighth round. If it takes Canelo five to six rounds to figure out Cotto, he (Canelo) will probably stop him by the tenth or eleventh round. If it takes Canelo seven or eight rounds, he’ll win by decision. If it takes him nine or ten rounds, he’ll lose by decision. If Canelo doesn’t figure Cotto out, Cotto will knock him out. Enter Freddie Roach. 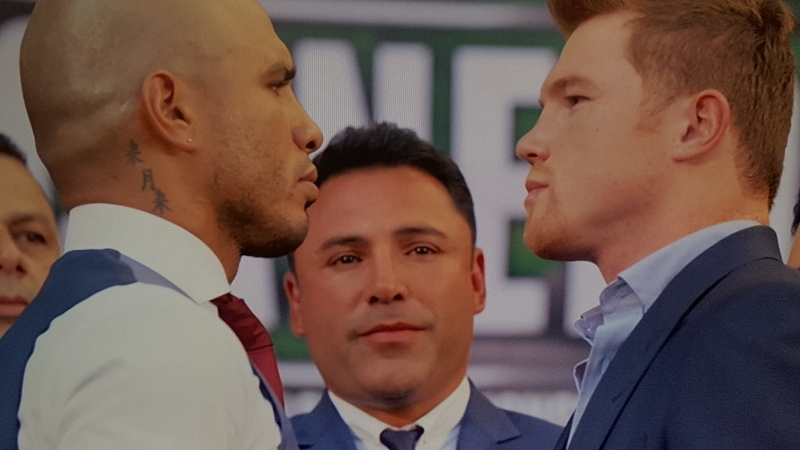 Has the hall of fame trainer instilled in Cotto to resist the urge to bang with Canelo? Cotto has lots of machismo and is extremely prideful. He’s not only fighting for his family and himself; he’s fighting for Puerto Rico. Do not underestimate Cotto’s intensity because of his calm demeanor. He has fire in his bones and will walk through hell if he must. Cotto’s stubbornness was put on full display when he suffered the first loss of his professional career against Antonio “Plaster of Paris” Margarito. It was never definitively proven that Margarito fought with illegal hand wraps, but many believe that he did based on the damage that was inflicted upon Cotto. Many pundits believe that Canelo’s performance against James Kirkland proved that he (Canelo) is a blood and guts warrior who can take it and dish it out. That still remains to be seen. It was a great win for Canelo, but Kirkland didn’t have his long-time trainer, Ann Wolfe, and he is probably on the downhill side of the mountain. There are also lingering questions about Canelo’s conditioning. If this fight morphs into a war of attrition, the edge goes to Cotto even though he is ten years Canelo’s senior. Cotto is smarter, probably a bit faster of foot, and has the better corner. He will get off early and may even stun Canelo, but I think Canelo will weather Cotto’s best shots, continue to pressure him, and wear him down. Canelo by late round stoppage. Professor Clifford Benton can be reached at clifford.benton. ← Previous Story Should Rousey Rematch Holm?…NO!